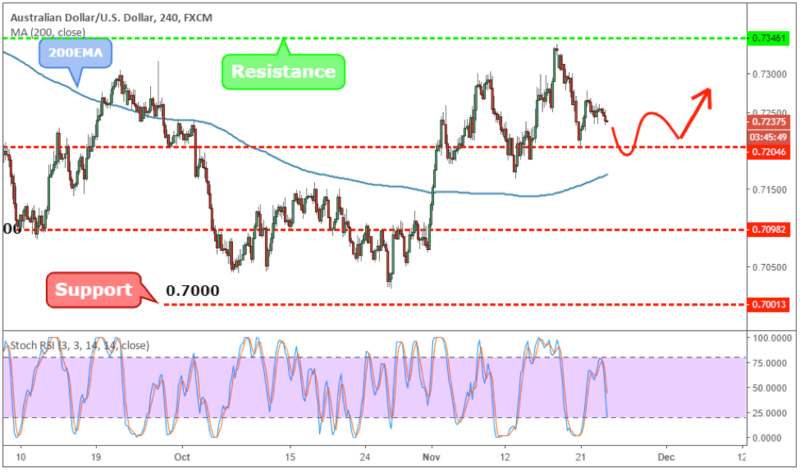 The AUDUSD is establishing a tight consolidation above the key support level 0.7200 and above the key 200 moving average. The resistance level established at 0.7346 is the upper bound of the current range zone. To the downside, we need a daily close and break below 0.7165 to suggest a shift in the trend direction. This will also open the door for a retest of support level 0.7100 from where we should expect the bulls to show up again. The stochastic indicator is in neutral territory and it doesn’t show any extreme readings that might suggest a change in the trend direction. The Australian economic calendar is also stripped away from key risk events that can cause a spike in the volatility. In this regard, we should expect a more technical driven market that is more sensitive to the support and resistance levels.